A rare miss. Sometimes it seems that every entry here is a raving success, an unmistakable masterpiece that has to be enjoyed time and time again. This is not one of those times. This 2010, from the highly regarded Columbia Valley in Washington, is described by some as “refreshing” and “off-dry”. It may be those things, but even more so it is sticky sweet. The 2010 Chateau Ste. 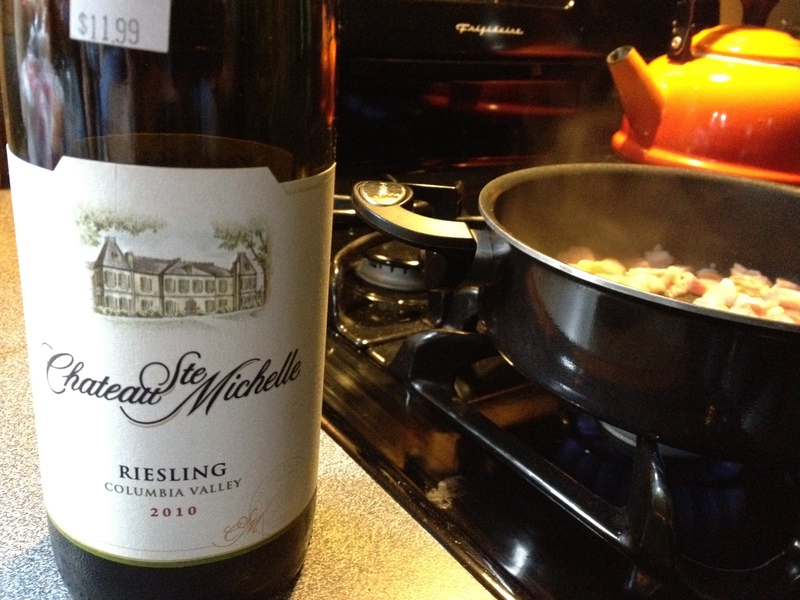 Michelle Riesling, from Woodinville, in the Columbia Valley region of Washington state. If memory serves, we pulled the cork on this to accompany a lovely pasta dish, penne with peas and bacon in a delicious white sauce. The food was very much the highlight of the meal, as my unrefined taste buds could only handle a single glass without needing some water chaser for the sugary taste of the Riesling (which I normally enjoy immensely come the summer months). What else can I say here? One, that it tasted better after we left the bottle sitting uncorked in the fridge overnight; and two, it was better when used as a cooking wine later that week. As I said at the start, this one was a rare miss for us. But give it a shot and let us know what you thought! This entry was posted in Riesling and tagged USA.